**SIGH** There, I said it. But, with it comes change, and as I mentioned in a previous blog post, it's the perfect time to evaluate the garden and see what stays and see what goes. I've had plans to change a few things around all summer (and beyond), but have waited until all of the Hardy Plant Society of Oregon's open garden days (mine, namely) were finished. Mostly because ripping up the garden is kind of stark at first, and is not what you want to present to curious strangers visiting your garden. So, in that spirit, let's look at a couple of areas - "before and afters" if you will - I have been working on for a couple of weeks. I think the "after" photos are not that satisfying as they actually look worse. Eventually, (hopefully), with a little faith, the plants will grow and branch out in good order and my master plan moves forward! So here's the first area a few years ago. It was all peonies and really hard soil. Not the best place for peonies, but it always filled in with green foliage and looked ok. I love the flowers, but the foliage left me flat. 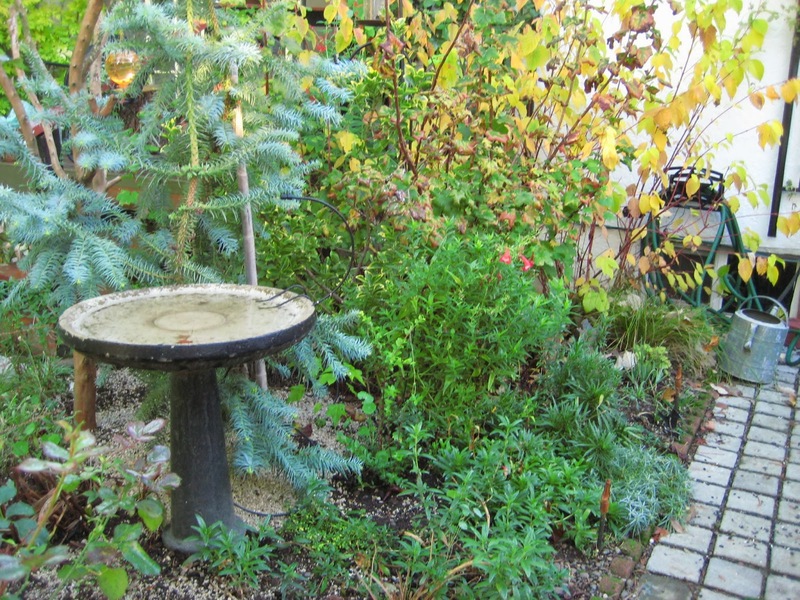 Here is the same area a few of months ago, a couple of peonies removed and a Phormim 'Jack Spratt' amongst some sedum. My instincts were to move the peonies all together but did not have the heart to do it yet. Then I got practical. Here's the same area last weekend with six new Sedum 'Matrona' (very small right now). My goal is to visually continue the line of sedums on the left (not in this photo) to harmonize the area. My goal is to have continuity rather than "onsie - twosies" plantings, something I have learned the hard way. Why sedum? I love the way 'Matrona' looks from its early stages to the beautiful foliage colors to the soft pinks of its blooms. Bees love it, too, and the seed heads are great for birds in the dead of winter - and it looks good en masse. So not very pretty right now but soon it will fill in and hopefully both Phormiums will also fill in to give some vertical spikiness. I also moved the dry birdbath with sedum in it - the only reason it was originally there was due to a chunk of foundation concrete directly below that means I cannot plant anything. Well, I dug around it, added soil and planted a Callistemon sieberi, a recent purchase from Cistus. And evergreen. Did I say I'm trying to add more evergreens to the garden? I am, for the dead of winter garden. So a Bottlebrush - and David picked it out! I think he liked it because it's from Australia which is a place he adores. I was thrilled. What do you think so far? Am I crazy? Well, yes. But. Here's some mature Sedum 'Matrona' in the evening light. Pretty, don't you think? OK - Moving on to area #2. Here's the area we refer to as the "Jurassic Garden" - before. It's a shady area that would like to be the "white garden." Same area, different angle - before. OK, I like hostas but this is my white garden so the yellow-edged hostas had to go. Again, am I crazy? Well, a girl's got to have her vision, right? Besides, I did not buy these hostas, I inherited them with the house, so there is no love lost with these gone. Also, they were too big for this area. And here's the "after". Three new 'Fire and Ice' hostas purchased at the HPSO Fall plant sale at PCC Rock Creek earlier this month. They have the creamy white interior on the leaf and fall right into my master plan! Waa aaah aaah...(evil laugh). Same area, different angle. You can just make out the three new hostas. They are medium-sized plants so hopefully will not take over like the last ones. It's really opened up now, but that's ok. It will fill in, with some prayers to the plant gods. OK, what do you think? Not quite so Jurassic, but I think I'll be happy with it next year, plus other plants now have a chance. This next area was never really photographed well. It is the area I'm directly looking at in this photo, there are two Ribes sanguineum or flowering currants in a SMALL area (amongst other plants, of course). One had to go, despite the fact that they are native to this area and are really great shrub-trees. They have beautiful pink blossoms first thing in the spring that hummingbirds adore and have yummy currants for the birds. This "before and after" is a bit more difficult to show in photos but I'll give it a go. This is the same area last fall, you can just make out the flowering currant in front of the yellowing leaves of the Cornus - Red Osier Dogwood (another great native plant for this area). It looks small there but this was a year ago. This thing grew fast, I cut out multiple branches throughout the spring and summer just to keep it in check. A few other things have been moved since this was taken - the whole area looks quite different now. Voila! OK, not much to look at, really. A stick in the ground and a sad little Abutilon by its side. But, this vine maple has some benefits: It's got red bark, so good contrast, they leaf out in spring with cheery chartreuse green colored leaves that turn golden in fall, plus it is a smaller version reaching only 10' or so, and it is slow-growing with a more graceful habit so I'm thrilled! Thank you, Scott, for the recommendation. This area is really opened up; it used to be a sea of green mass. Now it has some contrast and other plants have a chance to grow rather than being smothered. Of course other plants in this area have been repeatedly moved around, a habit (for good or for bad) of mine. There's an Australian mint bush below for some evergreen action - it was in a bad spot but now it's right at home. Add a few Heuchera 'Marmalade', some grasses and some Mimulus aurantiacus and the orange/red/yellow section of the garden is coming together. Now all I need is patience. OK, area #4. Last area for now, this one is out front. We have been in the back garden up until now. This is the Phygelius I mentioned needed moving, or rather a new home. OK, here's the after! You can actually see the Arbutus trunk now. I have moved a Rhododendron occidentale, or Western Azalea, in its place. It's another native and has a fabulously scented bloom. It's deciduous, too. Here's another view, the newly opened up area. All in all, I am happy with the changes, but I know I will need patience for the new plants to fill in properly. So what do you think? 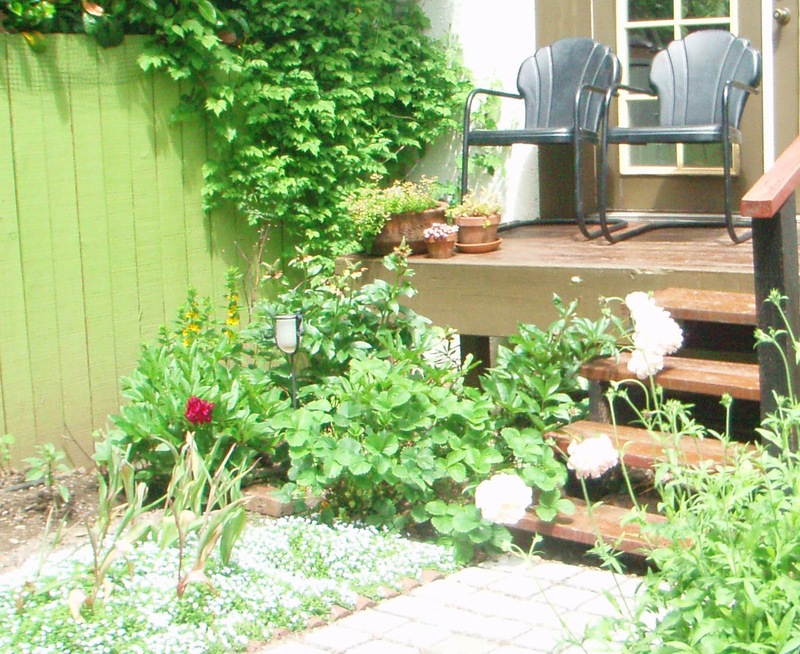 Have you moved around things a million times and changed things significantly in your own garden? Do share your experiences in the comment section, I'd like to know I'm not the only crazy obsessed gardener. Oh Yes, I spent a few months late winter and early spring moving all kinds of stuff around, including a good handful of shrubs. I think you'll like the vine maple. I have that variety, and it's a great small tree. Mine probably doesn't get quite enough summer water, and the leaves tend to turn crispy and brown in late summer, rather than yellowing and falling naturally. I've got more plant Musical Chairs to play this fall/winter too. In fact, I've already started. Good also to get feedback on my new vine maple, I'm really excited for it to grow! Musical Chairs, yes - that's an excellent description. I feel like that's my whole existence lately, but sooner or later it has to end, right? I'm so excited you found that Vine Maple! Yes...I'm constantly moving things around...I don't ever stop! Yes, THANK YOU!! I never would have known about it without your suggestion, so I'm thrilled and lucky! Moving around...just finished last round of what Alison calls Musical Chairs for plants this afternoon. Someday it will stop, right? Ha ha...I know better....thanks Scott!